Exploding demand for bandwidth is pushing data center teams to rethink their network infrastructure as they look to support faster data speeds, lower latency requirements and future changes nobody can predict. Easier said than done. Fluke Networks' CertiFiber® Pro Optical Loss Test Set now incorporates CommScope’s exclusive SYSTIMAX® link loss calculator, transforming the certification of ultra-low-loss singlemode and high bandwidth multimode fiber optic network projects in data centers.The SYSTIMAX calculator accurately computes total link loss performance for SYSTIMAX low and ultra-low loss systems. 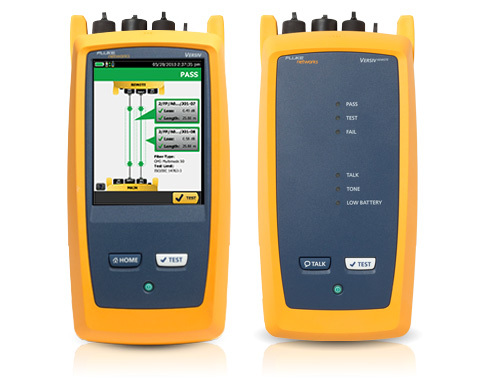 The integration of the SYSTIMAX link loss calculator with Fluke Network’s Versiv provides automated performance for warranty certification for both singlemode and multimode fiber systems.